It must have been the wonderfully cool winter we've experienced. The lettuce planted in the fall garden in November has been producing prolifically ever since. It's a good idea to plant what you like to eat. Simple and true. Bright green tender leaves of organic romaine are just as pretty as a colorful flower ... aren't they? Planting two varieties... one with shades of purple along side the green not only makes the garden pretty. They make a big bowl of salad pretty, too. And pretty is important. One January afternoon after having enjoyed several mini-harvests, I harvested every plant down to the ground. All at once. The forecast that temperatures were dropping to the mid-20's would just be too cold for these tender annuals ~~ so I thought. 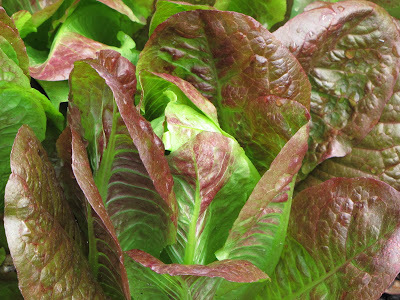 That bounty gave us fresh lettuce for two weeks during those coldest wintry days. The lettuce plants happen to be in one of the two beds that weren't run over by the construction crew. That entire patch of hand-scissored stalks came back to life rapidly after that and it continues to give us sweet leaves of nourishment in March. Lots of good, yummy salads filling our baskets and tummies while I've been restoring the rest of the veggie garden back to a recognizable state. 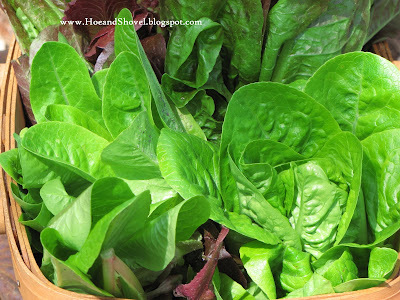 There's nothing prettier than fresh lettuce from a garden (like yours)! Yum! I agree that veggies are just as pretty as flowers. Meems - 'harvest' is hardly the right word; more people would eat salads if the lettuce looked like this! (Do you keep a body guard in your garden, so the furry little animals don't mow it down?) I planted Bloody Dock one year - it was vapor before it even had a chance to root! I vote "yes" as well! That is a beautiful harvest and lovely photos! Such a wonderful harvest! Lettuce and salads are great to have on hand all year round, and the two differeing colours mean slightly different nutrients too. 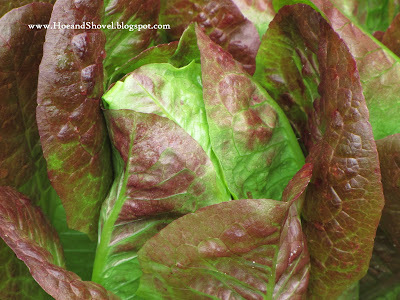 Shyrlene is right, if all lettuce looked this good everyone would eat it! Yum. Both kinds look delicious Meems. I just saw starts of Romaine, spinach and another red leafy one (can't remember the name) for sale at our local Walmart! I was thinking it was too early to plant but after reading your post, maybe I should have bought some??? Enjoy the bounty! Your lettuce looks fantastic.I might get some,if the bunny would just leave mine alone. Ohhhh you are going to have some yummy fresh salads....looks good. your lettuce looks wonderful! like you, i planted romaine and another colorful addition, red sail. 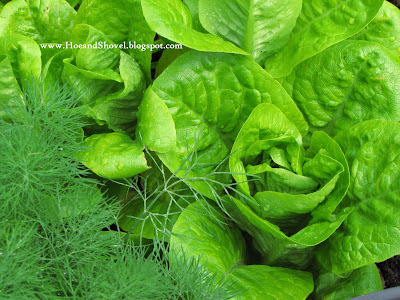 they look striking side by side in the garden bed, and even more so in my salad bowl! this was the first winter i've tried growing lettuce, but it was extremely easy and i found them to be quite tolerant of all the cold weather we received. i will definitely be growing more in the fall - in fact, i'm kinda bummed that lettuce season is almost over! Gorgeous greens! They look so inviting. Thanks for the info on which varieties and where you purchased, I'll have to give lettuce a try this fall. I'm beginning to think fall is the best season for growing veggies here in Florida. But, even with some seed starting problems this winter, I am growing a few things this spring. I look forward to seeing your spring bounty as the season progresses. Meems: Your lettuce looks so tender and delicious! I am impressed that your veggie garden still looks so beautiful after the well construction. I too planted two varieties in my tiny veggie garden, the purple leaf one is one of them. BTW, when I started reading this post, I was hoping to see a picture with Bulbine standing among the veggies... Just curious to see how that combination would look like. I think it should be beautiful! I have been trying to grow lettuce in my Mississippi garden, but it never looks this good. Thanks for telling us what varieties these are. Do you direct sow the seeds? How much sun does your bed get? Meems, I'm not a veggie gardener, but I've been reconsidering my stance since I've joined blotanical and read about so many lucious, yummy veggies. I do believe in home grown...just not my own. Truth be told, I've not been successful at it, so I gave up. BUT, your lettuce is truly enticing. And it IS as pretty as any flower! Looks like you had an outstanding lettuce crop dispite the weather adversitys. Great job! Lettuce so tender and pretty is a wonderful commodity. Adding color and flavor to the garden... what could be better. Amazingly we don't have any little bunnies eating our lettuce. We have had our share of armadillos and peacocks causing problems in the past. We are learning to appreciate every facet of the garden and the prettiness it offers. It's great to have fresh greens for all the salads that get made around here. And thanks for reminding me about the nutrients. I wasn't even thinking about that. The winter crop of lettuce grows so easily here. It seemed to really like the cold climate this winter. I think I remember you planted your lettuce in pots last year?? Maybe the bunny couldn't reach it when it was up higher. I would not be happy if a bunny helped itself to my lettuce. Such fun making salads. Had one yesterday and again today. Yummy! It was an easy year for lettuce. I've got more growing in the spring garden but it is always a gamble whether it will come to maturity before it gets too hot. I harvest it early and when it is young just in case. Like you, I wish the season would last all summer. Lettuce has proven to be one of the easiest things I've grown. When I first started veggie gardening two years ago lettuce really intimidated me. But one good season and I was captured by its goodness. I started more lettuce seeds in February and hope to harvest it before it gets too warm again. The lettuce is growing in a framed bed that the well-construction didn't disturb. The rest of the garden has been re-built and is growing happily so far. I used the bulbine as a border plant to the newest veggie bed. If I can ever get around to finishing that post I do have a photo of it included. You are going to enjoy lettuce soon from your own garden. Very nice. I've put some herbs and veggies out in the back garden this season, too. Mixed them right in with my planting beds. You could so easily incorporate a few things right into your sunniest spots. Hey there. So nice to meet you. I do direct sow my lettuce seeds. In the winter my veggie garden only gets about 4 hours sun at most. Now it is getting about 5. You could easily get your kids involved and make it a family project. You've got some sunny spots you could make use of for good home growns. It is worth trying it again!!! You probably don't remember but this lettuce was replanted 3 times due to armadillo adversities... then the freeze came once I finally got a crop ... then the well-diggers. But the lettuce prevailed! 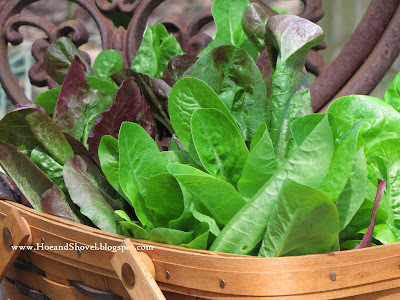 funny to read this post today because i just planted lettuce in some of our containers. i just could wait for the large veggie garden. that lettuce looks so scrumptious...enjoy it. reminds me of that wonderful salad i had on the day of my arriving in fl. oh my such goodness. those seeds sure were a great investment. Glad to hear part of your garden was saved from the construction crew. It's funny how those tender looking greens can be so cold-hardy. You'd think freezing temps would finish them off quickly. That rose-tinged romaine looks pretty and yummy. Hi Meems~~ I've always said that lettuce is as pretty as any flower. Yours is a perfect eye and tummy candy! Great garden. I'm trying my hand at lettuce this yr. I hope I haven't waited too late. But with all this cooler than normal weather I thought I'd try it. All my other veggies are up & doing good. I plant in tubs or whiskey barrels. Can't meet the ground.